Silverstein revisits the medium as a serious venue for autobiographical reflection, inherent expressivity and storytelling techniques. In the freedom of creating high art representations using popular images of the superhero, Silverstein absorbs and interprets the theme to pose questions about the self, identity and the possibility of transcendence in the modern world. Can people really evolve and change? Which is the real and which is the assumed identity? 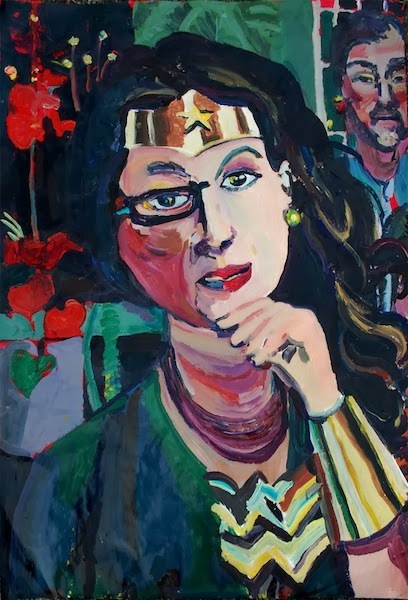 What is the role of the hero in contemporary life? 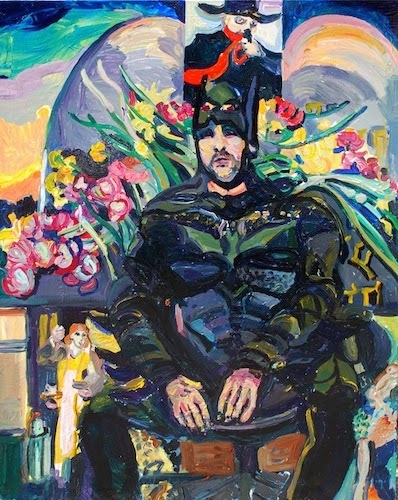 The artist fully equates the power and prestige of comics with that of traditional European oil painting. 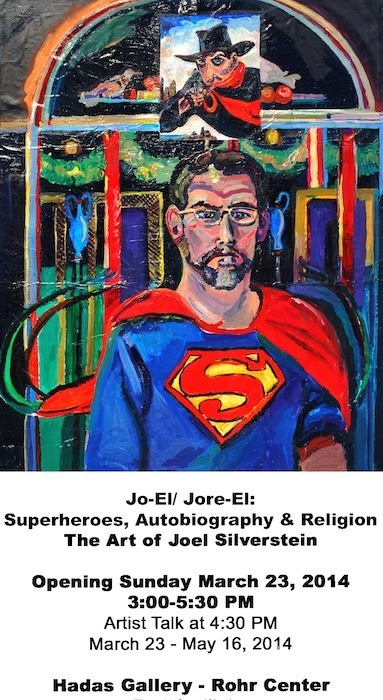 The exhibition’s signature series, Jo-El/Jore-EL presents self-portraits of the artist in a Superman suit. The image of Superman is examined as commentary, relating historically to the advent of pulps and comics as a mass medium in the 20th Century. It is also a phenomenon generally commensurate with the beginnings of the modern individual. 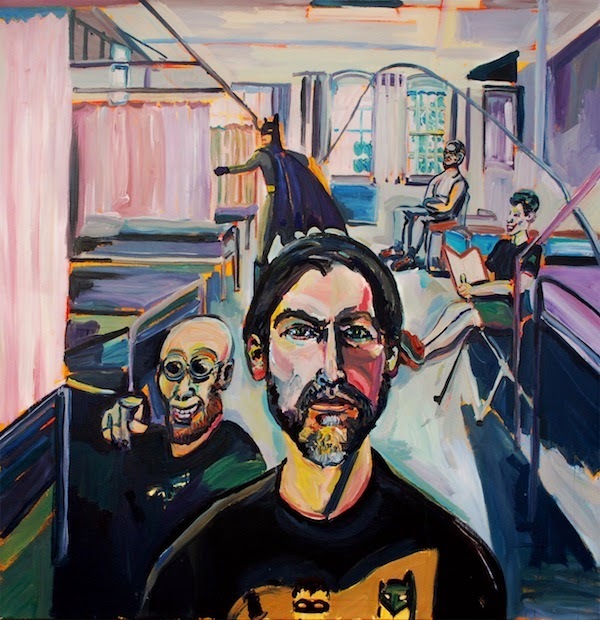 The painting, House of El, 2013 presents a double portrait of the artist, one in “civilian” clothes; the other in action gear, examining the roots of the Superman character within a multi-cultural context of Jewish, Christian and Pagan sources. The exhibition culminates in a 16 foot mural modeled on the scale of 1950’s Cinemascope movie screens. 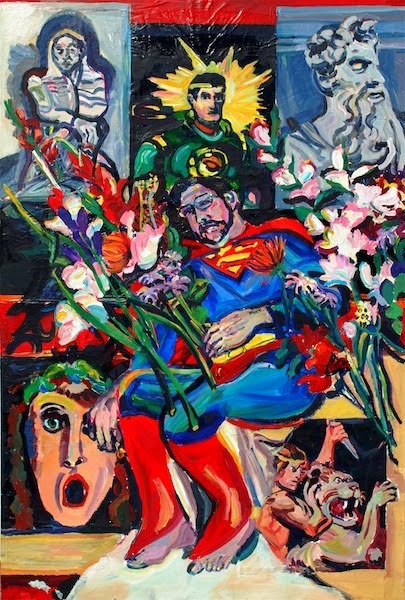 The large narrative work entitled, Superman in Exile, 2013 depicts a somewhat pensive superhero confronting the ovens of the Holocaust with the aid of magician and escape artist, Harry Houdini. Can Superman and Houdini transcend death? Franz Kafka, Walter Benjamin, Chaim Soutine and Jack Kirby meet on the battlefield of narrative painting; a slug-fest of epic proportions! Review by Richard McBee "Silverstein's Heroes" here. Start out going North on CLASSON AVE towards DEKALB AVE.